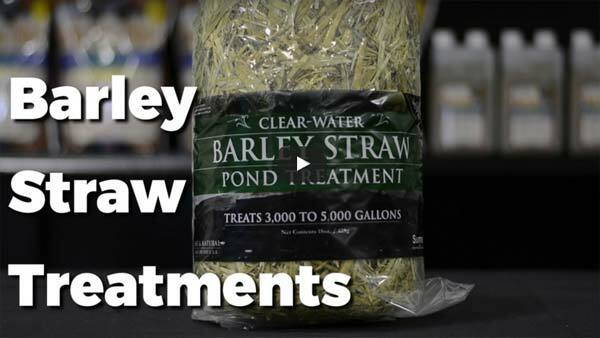 How To: Cleaning Pond Water - Barley Straw Treatment The use of barley dates back to the treatment of acre farm ponds hundreds of years ago. Today, it's still widely used, and quite popular. Used as a natural water treatment and conditioning aid, the treatment process is actually quite interesting. History: The use of barley dates back to the treatment of acre farm ponds hundreds of years ago. Today, it's still widely used, and quite popular. Used as a natural water treatment and conditioning aid, the treatment process is actually quite interesting. Treatment: Let's start with the basic barley bale. For the most part, they float and rot (breakdown), during their initial start-up. As they break down, a chemical process begins where humic acid is released. This humic acid then mixes with the dissolved oxygen in the pond. This combination actually releases a low, safe dose of hydrogen peroxide, which in turn ultimately aids in clarity, binds nutrients, buffers the water, and provides a mature healthy ecosystem.